With our new advertising concept zentrada gives you new sales channels and access to the most efficient platform with the widest range for sales advertising and promotion in Europe. Every month, more than 500,000 visitors and users are searching for interesting products and suppliers on zentrada. 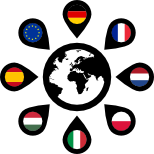 Here, you are able to meet a market with really diverse interests and discover the potential of trading in Europe. This could never have been accomplished with print advertising. Attract potential customers where they look and get an enormous number of contacts and visibility. Advertising couldn't be broader, cheaper, and more efficient. The domestic markets are limited. With its advertising platform and distribution network zentrada offers you a fast and cheap access to more than 400,000 commercial members and even more visitors from the wholesale and retail industries. The internet is an advertising platform as well as a sales channel and thus is achieving maximum efficiency on the side of both buyers and suppliers. Therefore, you increase awareness, image, and sales with one campaign - everyone buys online! 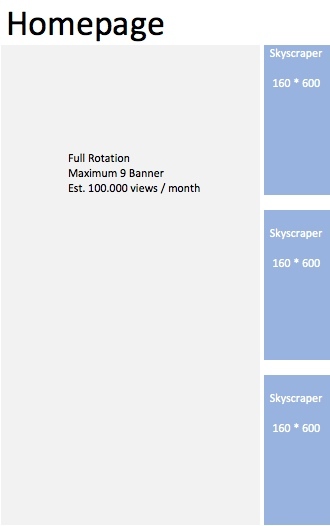 Limited Skyscraper Advertisement Space with rotating placements on the homepage and in the categories and Buyer's World. Exclusive “Marketplace center banners” for dominant market advertising with All-View-Guarantee on theme markets and search results. Greater reach and visibility with All-View-Guarantee in categories and theme markets. 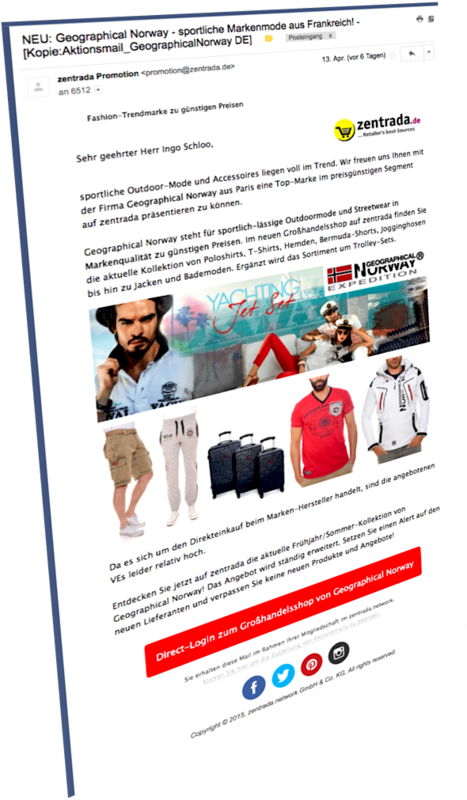 Europe included – our entire reach for more market potential and your success. Standardized monthly run-times for easier organization and planning. Tracking and linking possibility for 8 different language versions and separated for members and non-members. Full-service banner production, translation to 8 languages and internal sales and click tracking through zentrada at a fixed price. Attractive discounts for zentrada suppliers who link the banner to their zentrada shop or salesroom. NEW: email campaigns for zentrada suppliers with direct linking to the zentrada shop or salesroom. Coordinated content and target group selection including email production and distribution. Your next deal is one click away! Valid from September 1, 2016 – book now – limited placements! + Europe-wide on the eight zentrada-Marketplaces. + rotating on 4 placements with maximum 9 banners. + expected views per month: 100,000 to 150,000. Licensed Products, Fashion & Mode, Jewelry & Watches, Health & Beauty, Householdt & Kitchen, Home & Living, Garden & DIY, Toys, Gifts & Stationery, Bags & Travel Accessories, Sports & Leisure, Cars & Quads, Consumer Eletronics, Food & Beverage. Depending on the product category and form of advertising the placement is exclusive (Centerbanner) or with limited spaces (Skyscraper) in the Product category registers, complementary buyers's worlds and matching search results (only Centerbanner) on the zentrada.marketplaces. All prices in Euro and plus German VAT 19% as far as no exemption is possible. + Europe-wide in the category of your choice. + All-View-Guarantee with rotating placement and limited number of advertisement spaces (2-7) per page. + expected views per month: 20,000 to 80,000. 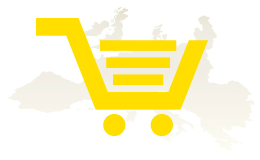 + exclusive placement Europe-wide in your category and search results. + AllView-Guarantee in the selected market segment. + expected views per month: 20,000 to 80.000. We will gladly support your advertising success with the design of your banner ads and translations by our offices abroad. with individual contents & target group selection – limited transmission slots ! Exclusively for suppliers in zentrada.network! Email marketing breaks the barriers of costs and reach while simultaneously addressing a large number of customers and target groups. zentrada.network applies technology, data bases, acceptance, and legal design to create new standards in member communication. We provide our suppliers with these affordable forms of advertising to actively promote sales. In order to protect the interests and acceptance of members content development, linking, target group selection, and transmission slots are limited. Nevertheless, we strongly recommend this individual marketing tool because of its selective impact, good measurability and low cost efficiency.